As per a recent market study published by Transparency Market Research (TMR), the global nebulizers market is forecast to be worth US$937.7 million by 2019. TMR, a market intelligence company based in the U.S., projects the growth of the global nebulizers market at a CAGR of 6.5% from 2013 to 2019. The market was worth US$610.0 million in 2012. The research report, titled “Nebulizers Market - Global Industry Analysis, Size, Share, Growth, Trends and Forecast, 2013 - 2019” is available for sale on the company website.The increasing incidence of respiratory disorders such as asthma, cystic fibrosis (CFTR), and chronic obstructive pulmonary disease (COPD) combined with the increasing geriatric population is primarily driving the global nebulizers market, as per the TMR study. Moreover, in developed nations such as the U.S. and the U.K., government initiatives to bring respiratory disorders under control will further boost the market. For the purpose of the study, the report segments the global nebulizers market as per product type and geography. Based on product type, the market is segmented into ultrasonic nebulizers, pneumatic nebulizers, and mesh nebulizers. 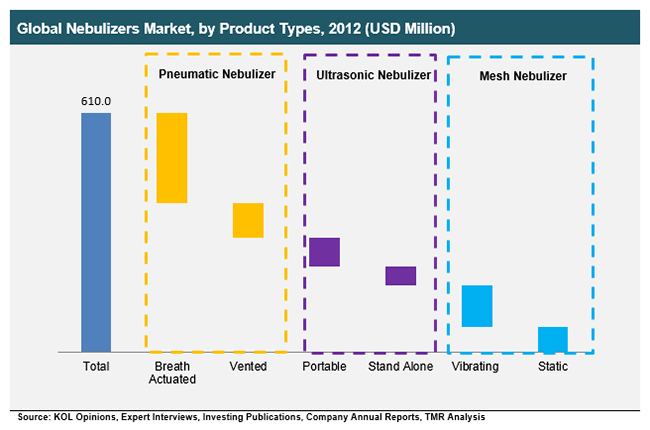 As noted in the TMR report, pneumatic nebulizers dominated the product type segmentation in 2012 owing to its cost-effectiveness over other types of nebulizers. However, factors such as slow drug delivery and low efficacy may challenge the uptake of this product segment of the global nebulizers market.Although mesh and ultrasonic nebulizers offer more efficient medication delivery than pneumatic nebulizers, high cost and the possibility of drug deactivation during delivery may inhibit the demand for these devices. As per geography, TMR market study segments the global nebulizers market into North America, Asia Pacific, Europe, and Rest of the World (RoW). Regionally, North America stood as the largest nebulizers market in 2012 on account of having the highest prevalence of COPD and asthma cases. During the forecast period, North America will continue to register as a leading market for nebulizers owing to further growth in the incidence of various respiratory diseases in the region.Europe followed North America in terms of market share of the global nebulizers market in 2012 owing to the large geriatric populace in the region. As analyzed in the TMR research report, Asia Pacific will exhibit the highest CAGR between 2013 and 2019, due to the rising prevalence of bronchitis and asthma in this geographical region. Growing pollution is expected to make China a significant party in the Asia Pacific market for nebulizers. Moreover, large medical device manufacturers are focusing on establishing a strong market presence and increased investment in the Asia Pacific region for higher revenue returns. The TMR study identifies and profiles the major players operating in the global nebulizers market, namely CareFusion Corporation (AirLife Misty Fast), PARI Respiratory Equipment Inc. (LC Sprint Reusable Nebulizer), Allied Healthcare Products, Inc. (Schuco S6000 Air Compressor), Covidien plc (Puritan Bennett 740 Ventilator), GE Healthcare Ltd. (iVent201), Philips Healthcare Ltd. (I-neb AAD System), Omron Healthcare, Inc. (NE C30), and GF Health Products, Inc. (iVent201).